Situated within a 5-storey building on the Damosa IT Park, this office space provides the opportunity for your business to be surrounded by like-minded companies from a variety of sectors - collaborate, network and innovate your way to the top. This flexible space's monthly rental fee is all inclusive, meaning you can benefit from cleaning services, high-speed internet and Wi-Fi access at no extra cost. 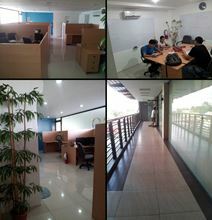 Office space prices from ₱11090 per month. A fully-furnished office space created with maximum productivity in mind. Staff are on site 7 days a week. The space has 24-hour security, a security system and CCTV. There is a well-equipped kitchen with refrigerator and microwave, where you can prep your food. There is a backup electrical generator to keep your business running smoothly. The centre is located in Davao City Ecoland close to all major transportation routes. Parking is accessible at Bachelor Tours Parking Garage. In the surrounding area there are many eateries, shops, hotels, supermarkets and ATMs. SM City Davao is located 22 minutes' walk from the space, where you can experience fantastic shopping, films and entertainment.